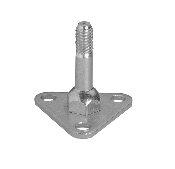 Metro Super Erecta Foot Plates are used to bolt units to the floor or when a broader, more stable foot is required. Replaces the standard post leveling bolt. Available in zinc, black and stainless steel finish. Compatible with SiteSelect, qwikSLOT, MetroMax i or Q posts. For specification sheet 10.06, click here. Note: Floor bolts not included.